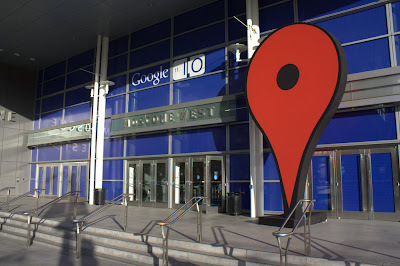 Just finished the first day of sessions here at io2011 with an Ignite session, great way to end an information packed day. 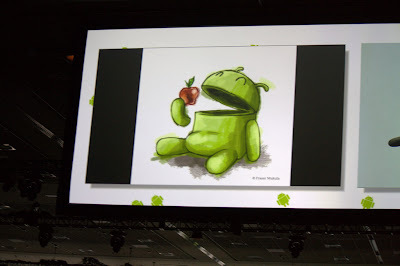 Started of with a keynote packed with cool announcements, I especially enjoyed the announcement about Android Open Accessory. Really looking forward to seeing some of the demos here on the floor, aswell as future products using this sdk. Google Music was announced, and available to the US as a beta, cool stuff. But I think I'm a bit spoiled already with Spotify :) The ability to rent movies in market will be cool to try out though (If we get it in sweden that is...) Android Honeycomb 3.1 & Ice Cream Sandwich was also released, good stuff. There were some obligatory small punches towards apple. Especially liked this picture. To top things of every attendee got their hands on the brand new Samsung 10.1 tablet set for release in about a month. It's a really slick piece of hardware. Attended a couple of really interesting sessions today, one talking about Advanced Developer tips for android devs, and the other one on Android combining App Engine and the ability to use C2DM. Missed out on the fireside chat with the Android team though :( Session room was full, and it seated like 500 people! Time to head downstairs for the After Hours party, should be an awesome party!